They taught us about sharing and the letter Q. They taught us to jump rope in Spanish and how to count to 10. They taught us about life in the city, diversity, and the true love of a rubber ducky. But did you know that Sesame Street actually has lots of lessons about how to be a better blogger? There’s a reason Sesame Street is the longest-running children’s show in history. Actually, there are (at least) five reasons. And you can apply each of these to your blog, to create something that’s memorable, effective, and maybe even loved. Malcolm Gladwell’s bestseller The Tipping Point revealed something surprising about our favorite show. When we watch, everything feels very casual and unforced. You’d never guess that Sesame Street was actually shaped by round after round of rigorous testing with pint-sized focus groups. Groups of little children were allowed to watch the show, with another appealing diversion just across the room. In other words, the testers tried to pull the children’s focus away. Each time a child’s attention skipped away from Sesame Street, the producers made a note. That segment needed to be made more “sticky,” more compelling, more effective. Kids are riveted to Sesame Street because the show is designed to be riveting. It looks informal and fun, but behind the fun is a lot of analysis. Find out what kind of content rivets your audience and glues them to the screen, and what kind has your readers skipping away to find something more interesting. Do more of what works. Do less of what doesn’t. What would Sesame Street be without Cookie Monster? Or Bert and Ernie? Or Oscar, for heaven’s sake? I’ll even admit that Elmo has a small (annoyed) place in my heart. The storytelling in Sesame Street is grounded in memorable characters. The lessons, both academic and emotional, stick with us longer because they’re brought to life by lovable, familiar faces. Storytelling and great characters create empathy, emotional involvement, intense interest, and even a sense of belonging. When we watch, we feel that Sesame Street is our neighborhood. How you can apply it: Embrace your inner Grover. Be a character on your blog. That character can be quiet or loud, smart or dopey, brave or cowardly. Don’t be afraid to be yourself, with all your strengths and weaknesses. Even if you’re a little bit goofy. Or furry. Or blue. Sesame Street’s segments are bite-sized and don’t demand too much attention or time. They keep the energy high with humor, music, color and fun. Each segment gets to a very specific point, and it does that quickly. The show’s writers understand that their preschool-age viewers have the attention spans of fruit flies. Unfortunately, our grown-up readers do, too. How you can apply it: Keep things moving. Punchy, brief posts nearly always outperform weighty tomes. Yes, Maki can pull it off, but most of the rest of us can’t. While the imagination of a child is nearly limitless, the focus of Sesame Street is nicely constrained. Letters. Numbers. Emotional or confusing situations faced by preschool children. That’s about it. Sesame Street uses the same sets, the same characters, the same animation styles, the same motifs to make these points again and again. There’s certainly enough variety to keep everyone interested, but the show never sprawls. They know exactly what they’re there to do, and they stick to the territory they’ve staked out for themselves. How you can apply it: Strive for the same balance of focus and variety. Yes, you want to mix things up so your readers don’t get bored. But you also need to find your own best territory, then explore that thoroughly. Don’t worry too much if you haven’t defined your territory yet. It can take some time to find your own “sweet spot.” But when you do, stick with it. Watch Sesame Street for a week and things will start to look strangely familiar. The show’s writers know that little children need repetition to learn. But they don’t hammer away at the letter A for an entire hour. That would bore their audience to tears. Or at least tantrums. Instead, Sesame Street comes back to the same lessons again and again, at intervals. Every day, people interact with Oscar and learn about handling grouches. Every day, the Count sings about his love of numbers. Every day, a letter and a number are selected. The show comes back to that letter and number again and again, in short bursts, with other material in between. How you can apply it: If your blog has key themes (and it should), you’re going to repeat yourself. It’s natural to try to avoid that, but you shouldn’t. Repetition is how you’ll get your most important points across. You’ll have to keep working to create fresh angles, metaphors, and interesting new frameworks for those ideas. That’s where a little art (and craft) can come in handy. Try putting these five techniques into your blog. You might not create something as magnificent as Sesame Street. But isn’t it worth shooting for? All I can say is, WOW. This is good stuff. Ha… life’s greatest lessons should have been realised by the time you are 5 (and mostly supplied by Sesame Street). hehehehe… it should be every child’s right to enjoy that show. Heck I’m wearing an Animal t-shirt right now. Great 5 valuable information, I like to test a lot of stuff on my blog, like changing blog theme, the colors and just recently I change my fonts to the same as yours. When I was a little boy, I love to watch, but now it seems I had forgot who is who in the show, but I still remember there’s a character that always use to press its nose, that’s my favorite part of the show. Eh anyone knows the name of the character? I think i would be putting on my pink sesame outfit whenever at my keyboards from now. What colour do you wear sonia, yellow? Thanks…your not at your domain anymore – remarcom. Seems to be an ongoing Copyblogger theme that storytelling is a great way to engage readers. This is something that is starting to creep into the FindaLondonOffice blog. Clearly, point 5 of repetition is coming in to play regarding storytelling. Clearly point 5 of repetition is coming into play regarding storytelling. Ok, I must stop trying to be such a funny guy now. I love your posts Sonia, I find them extremely informative, loved the conversion killer writeup. That post inspired a little troll pic weaved into our blog’s latest post about office commissionaires! It never ceases to amaze me . . . some of the best advice is also the most simple. Just because we’re no longer three years old, doesn’t mean there aren’t lessons we can all learn (or re-learn) from Big Bird & co. I think I need to go put some music on. Indeed, I think it’s time to start scheduling in time to watch childrens TV on a more serious level than ever before. Excuse my typos above by the way, I just had a giant cup of caffeine and am rather twitchy at the mo. Dealing with grouches crosses over into people management, the cookie monster educates us about the risks of overindulgence, Elmo teaches us about how it’s possible to be infinitely irritating but still maintain a magnetic shroud of charisma that keeps kids coming back for more despite the nightmares. Very creative and interesting post! Good work! Brilliant analogy, Sonia. Lots of people will be able to identify with this. A nice revisit to The Tipping Point! Readers can tell the difference between a repost and a revisit. This is the difference between a new perspective/angle and just hitting that retweet button. We crave perspective (and leadership); it’s what drives understanding AND creativity. So, every time your doing a repost, make sure it’s more like a revisit. Love to link? Find a bunch of related links, explain how they are connected, and answer why we should care about them in your perspective- emphasis on YOUR perspective. Knowledge is becoming less scarce. Great post with some nuggets of wisdom…Ah, Sesame Street is probably the most influential show I watched as a kid. I’ve always loved Grover, who seems to have been forgotten with Elmo getting all the attention, but that’s for another post. I would also add that Sesame Street was also very visually appealing – almost to a point of mesmorizing. I couldn’t keep my eyes off the screen. Oh, and the fact that kids can learn through seeing and hearing is great as well. Thanks for some good insight! I remember reading in Gladwell’s book about this idea of Sesame Street being so well-produced and thought out, but didn’t know how it could directly relate to what my business was. These approaches you’ve outlined, Sonia, would be ideal for bloggers and any online business. Thanks! I’m really glad you mentioned repetition. I have seen some comments on this blog and other popular ones where readers complain that the content is recycled. YES! It should be (especially since it’s always done through a different writing lens)! As you pointed out, it’s not only children who learn through repetition. I appreciate being reminded of all the little (and big) things we need to know to improve our writing and blogging. repetition can be done. But, you can always change the perspective of the same old concepts. Sonia – do you mind if I re-post entire article on a website I maintain for New Leaf Publishing Group authors? With attribution to Copyblogger and yourself, of course. This post clearly demonstrates that point… all of these tips have been said before, but you’ve reinforced them with nostalgia. Good job on following your own advice! If no one has told you in a while, you’re a real asset to this site. Bringing you on board was one of the best decisions Brian ever made. @Colin, nice distinction between revisiting and reposting. @Shashi, boy, Children’s TV Workshop has done just about every other kind of tie-in product, you’d think that would be a shoe-in. You’ve just convinced me the direction I was thinking about going in is the right direction to go in – my previous posts have been a bit rambling (and it’s quite a chore, is rambling). I think sometimes it’s nice to have a long post but I want to move towards posting ‘little but often’. Really liked this post, ta. Really loved the simplicity while you were making worth-applying points. we can learn from anything and anything can learn us. Less is actually more, huh? how the heck can you be able to relate things like this. I really need to learn how to connect things that seem not obvious but do follow somewhat universal rules. Haven’t thought about the show like that before but those points do make sense. If it’s not effective for children to learn basic stuff, why does it exist so long? Something to ponder over the weekend…. @Paul, I don’t know about Brian, but I’m scared to watch Teletubbies. I’m pretty sure it will turn me into a pod. Amazing, like usual. Your point about repeating your point is so, so, so true. The best blogs I’ve been on have a few major themes they -constantly- “harp” on — but in a good way. Great post, as always. 🙂 The only thing left is to apply it to my sites. That is so interesting about the stickiness testing Sesame Street did. Great post Sonia. Thanks for a great post. I really love the piece on repeating yourself. So often in our quest to avoid being boring we completely lose our audience because they can’t keep up and lose track of our random thoughts. Spaced repetition is a well known but little used form of learning and it seems to make sense to use it throughout a blog. Loved the piece, but found myself living it from the user side. How? I totally skipped the Sesame Street analogy for each entry — sorry, don’t care about SS — and went straight to the “How to apply” summary. Great structure here, I got all the value in half the time. And, a lesson in focus. True, very true. I believe testing, testing is one of the most valuable tips that the author provides. Everything else may fail. However, if we persist and test our posts, we are sure to become good bloggers. It never ceases to amaze me what we can learn from kid’s stuff. I’ll have to start paying better attention to what my kids are watching and see if I can find any life lessons. Just another reminder that we already have the knowledge within our grasp, we simply need to shift our perspective. What seems obvious isn’t and what isn’t does. There is some hope for this simple brain, after all! BTW, I love this blog. It keeps me coming back. Wow that is amazing. I really need to step my game up. Awesome post. Good Tips Mate I will surely follow these to become a successful blogger. I currently run Tech and SEO blog. Wow! I’ve read Tipping Point too, but I’ve never thought that the things Malcolm Gladwell said could be applied to blogging. Thanks for the insights! 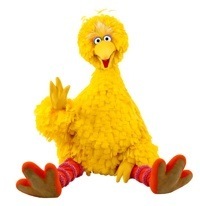 Does big bird have a blog ? Because that would be super cool. That is a great analogy (brought back some happy memories too). In fact, it’s so handy, I think I’ll put up a sign with the 5 headings as a reminder (maybe even with an Elmo pic). Thanks Sonia, very helpful. I remember when I first learned that Sesame Street was painstakingly “focus-grouped”–I was devastated. I felt like Big Brother was planning my childhood entertainment. That was awesome thanks! I stumbled and tweeted! Popnbottles.com – a blog for RAD DADS and those who love them. Will Tweet this article. Thanks for being a good writer. Absolutely fantastic analogy and post. The be yourself is so important when blogging and engaging in the social media platforms. Put yourself out there and let people know about you to get them to engage with you and start trusting you. Also, the repetition is such a great point to remember and stick by. more friendly and human touch. Thanks for the great tips Sonia! Very interesting comparison of Sesame Street & blogging. Great job. Wow, impressive application you’ve got going here. Oh, we can’t leave out the friendly/giving factor as you all know. That has been my experience in the blogosphere so far. Amazingly kind, giving individuals like yourselves. 🙂 Thanks for sharing, if there’s anyway I can give- please let me know! I’d pay to read Big Bird’s blog. Seriously though, thanks for the great content. Good work. Well, thanks to @ryanstephen, I’ve discovered some great posts today. I realize I’m more than fashionably late, but I didn’t want to pass up the chance to say thanks for the excellent analysis. And my attention span appreciated the brevity. I loved Gladwell’s book, especially the segment on Sesame Street. Like Charles, though, I never thought about applying principles for children to the “grown-up” world of blogging. You should consider writing a follow-up using the Blue’s Clues example from the same chapter. Same result, completely different approaches. Yes! I can’t tell you how many times I see people doing the same things over and over (often with disastrous results to their relationships, business, etc. ), & yet they continually expect things to change. Okay, little did I know how an analogy of a cult children show could be so chillingly applied to the blogosphere. It’s an entertaining yet educational article, yet again.